I started reading Peter Benchley’s 1979 novel The Island sitting in a waiting room, for lack of anything better to read. And the sucker hooked me. For those who don’t know, the late author was the son of Nathaniel Benchley and the grandson of Robert Benchley, both literary figures of high reknown. He was also the author of Jaws, the novel that was the Twilight of the early Seventies. Jaws the book is nowhere near as exciting as the classic film adapted from it: it’s a potboiler, filled with contemptible characters that even the author doesn’t seem to like very much. But it sold like gangbusters, and set Benchley on an unsuccessful quest to replicate its success with a series of water-based thrillers (The Deep, Beast and White Shark, one of the worst books by a so-called “major” author I’ve ever had the misfortune to read). 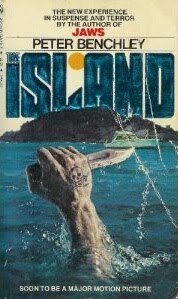 The Island was his second novel after Jaws (following the sunken-treasure tale The Deep) and centers on magazine writer Blair Maynard (a typical name for a Benchley hero; the main character of The Deep was named “Romer Treece,” Beast’s hero was “Whip Dalton,” and so forth). Maynard and his twelve-year-old son, Justin, head into the Caribbean to investigate ship disappearances, but what should have been a father-son lark turns unbelievably grim. They run afoul of an isolated population of inbred descendants of 17th-century pirates who co-opt Justin into their ranks and plan a grisly end for Maynard when he’s no longer useful. These are not the rollicking buccaneers of Errol Flynn and Jonny Depp, but disgusting, bloodthirsty killers with appalling levels of hygiene. The first third of the novel is a crackling good mystery-adventure with a surprisingly realistic father/son relationship. It was this aspect that caught my eye and kept me reading. Maynard wants to be a good dad, and tries very hard to stay connected to Justin despite being divorced from the boy’s diffident mother. He’s conscious of his status as a role model, and even if he never quite lives up to it, he sincerely tries. And Justin is depicted as a normal kid, neither precocious nor infuriatingly dense. Unfortunately, once the Maynard lads are captured by the pirates, the novel’s considerable momentum slows to a crawl. Justin vanishes from the story for long stretches, and we spend our time with Maynard senior and the pirate woman who wants him to impregnate her (yep, you read that right). And here’s a tip to you would-be adventure writers out there: if you want to keep your readers on your hero’s side, don’t have the villains give him an enema. In graphic detail. Really. For any reason. If your plot demands it, then you should seriously re-evaluate. Sometimes your fetishes should stay private. Eventually Maynard realizes that Justin likes the bloodthirsty pirate life, and so the battle becomes one for the boy’s soul. I won’t give away the ending–hell, if you slog through the last third of the book, you deserve the suspense–but its impact is considerably lessened because we don’t see Justin’s gradual transformation from comic-reading ‘tween to Blackbeard-in-waiting. I don’t know what Benchley was after, exactly, but what promised to be a neat modern twist on Treasure Island becomes instead one more sad artifact on the trail of a writer trying to reclaim the buried treasure of his debut novel.